Mettâtations - a simple practice to help fill your mind, body, and heart with peace, love, and compassion. Click on a link to learn more about how each of these fits into Mettatations. Flourish is Martin Seligman's 2014 book on Positive Psychology. The good life is made up of more than being Happy; it is about having and cultivating Positive Emotions, Engagement, Relationships, Meaning, and Accomplishments (PERMA). As mettâtations positively affect every aspect of our life, they will positively affect each of these 5 components of flourishing. All of the mettâtations are designed to increase your PERMA directly or indirectly. And I developed several specific mettâtations to help actively appreciate and cultivate each of the 5 factors of flourishing. May your Mind be full of Peace, your Body full of Love, and your Heart full of Compassion. Mettatations were specifically designed to help you cultivate virtues like flourishing. View our previous Mettâtation Newsletters. Mettatations actually have goals: to help you increase your happiness, mental and emotional health, and to help you have more positve emotions, relationships, and meaning in your life. The virtues below are the things that make life more enjoyable and fuller. If you can cultivate more of these in your life you will have a better life. You will have more health, happiness, and well-being in every area of your life. With Mettatations it's easy to increase the Peace, Love, and Compassion in your life. Peace is a cornerstone to a happy life. When you have more peace in your life you have more control in making your life the life you want. Your health is better, your relationships are better, your decisions are better. Love is the answer. It all goes back to love. To learn to truly love, honor, and take care of yourself and others. When you feel love, everything in your life is easier. Compassion for yourself and for others. Often we need to step outside of ourselves and see the bigger picture so that we can understand what truly is happening. We all make mistakes, we all want love, we all what to contribute. Forgiveness for ourselves and others. Forgiveness can be a challenge. We need to learn how to manage our egos and let go of attachments. To focus on the future, positive solutions, and the things we can positively affect. Gratitude is one of the keys to health and happiness. We are all dependent on one another and this planet. There are so many things and people to be grateful for, and when we practice gratitude we realize our connection to others and ourselves. Freedom from Judgement - Freedom from self-judgement and judging others. We label things as good or bad too soon. We avoid discomfort when sometimes we need to deal with it and look for the lessons. We are all sacred, we are all learning, life is a constant growing journey to enjoy. We need to develop our Strength and Confidence so that we can pursue our dreams. We all face challenges and we need the strength to take care of ourselves and do the work we need to do to full, happy, healthy lives. Courage to live your life. Courage to stand up for what is right. Courage to follow your dreams and be the person you were meant to be, to reach your highest potential. Wisdom to make good decisions. Wisdom to act, not to react. Wisdom to appreciate and respect everyone and everything in this world. And to act in it's best interest. 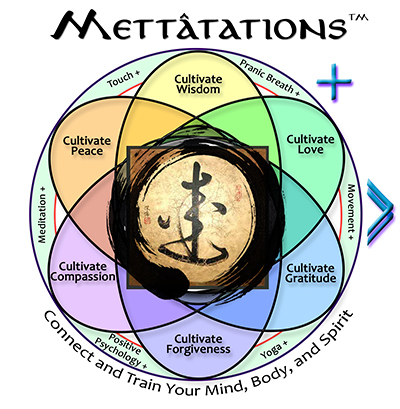 Mettâtations are the integration of several practices into new healing, restorative, and energizing practices. To understand the practice fully, you can examine the individual and integration of the different components listed below. Mettatations are powerful and multi-faceted practices directly connecting the internal (mind, body, spirit), external (others/world), and universal; with the past, present, future. How we use our mind to help ourselves flourish is the most important thing to master. Happiness only comes from within our mind. What we think about things is more important than the thing that happens. Let's actively build positive thoughts and turn them into positive actions. Air is literally energy. We take the breathe, the air for granted. The air we breathe holds the energy of the universe. We can bless the air we breathe and use it to heal and rejuvenate our body and mind. Touching is essential for normal human development. Yet, in many cultures we don't touch. Unfortunately, touch, like love, can be misunderstood and make people uncomfortable. Yet it is an extremely powerful energy source that we can use to heal and energize our body and mind. Movement during Mettâtation. Movement helps us to directly access the energy in our body so that we can replace it with positive energy. Movement is encouraged in Mettâtations. Move and do what makes your body feel good! The meditation part of mettâtation practices is different. Mettâtations have a goal. Instead of trying to create space from our thoughts, we are actively creating positive thoughts and energy within our mind, body, and hearts. Mettâtations fall under the larger 'Yoga' umbrella. 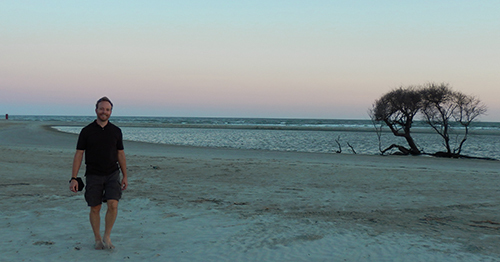 It is a combination of the branches of Yoga into a new practice with the added advantage of integrating the latest benefits of positive psychology research. Move, Breathe, Live Well. Peace, Wisdom, Love, Gratitude, Forgiveness, and Compassion lead to Positive Thoughts, Positive Energy, and Positive Actions. This is the doorway to heaven, to happiness, and to well-being. Thank you for visiting Mettâtations - Steven Dietrich - Dietrich Designs And Solutions. All materials ©2011-2016.